May 28 is National Brisket Day. Although brisket belongs to tough meat, you can make it fork tender and delightfully tasty. Brisket requires slow cooking on a low fire, otherwise meat will be too tough. 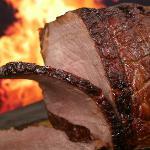 During the cooking process tough tissues are broken down, that is why you have a tender piece of meat. There is one more feature in cooking brisket. Always cook it a layer of fat atop. It will help prevent piece of brisket from drying during cooking process. But if you want your brisket to be flavorful and not too fat, make sure that fat layer is about 1/4 inch thick. Any thicker areas of fat should be cut off, otherwise the spices flavors won't penetrate the meat. Spice mixes are used to give brisket a special flavor. Mix usually consists of salt, brown sugar, garlic, cumin, chili powder, black pepper, but it can be changed to your liking. Marinades are typically used to make meat tender. Soy source, Worcestershire sauce and liquid smoke are the most popular choices. Today you can cook brisket any way you want. Add some spices to marinade to make brisket flavorful and tender.